Open iChat AV by clicking on its icon in the Dock or in the Applications folder. 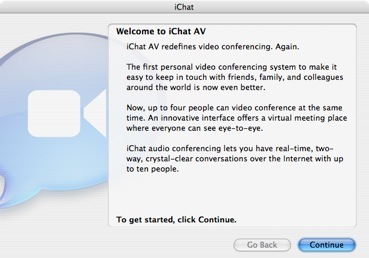 A dialog box opens to help you set up your account after you launch iChat AV. Follow the instructions in the screen (you’ll need to know your .Mac email address or AIM screen name and your password for your account) to configure iChat. If you don’t have an account yet, click “Get an iChat Account” to sign up for a free one. 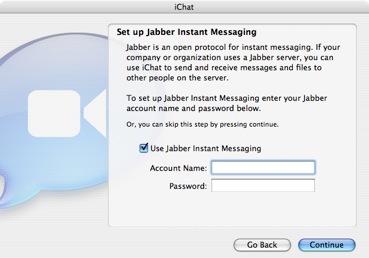 iChat also supports Bonjour (a messaging protocol used to communicate with other users on a Mac network) and Jabber (the messaging protocol used by Googletalk). To use Jabber you will need to enter your user information from your GMail account. 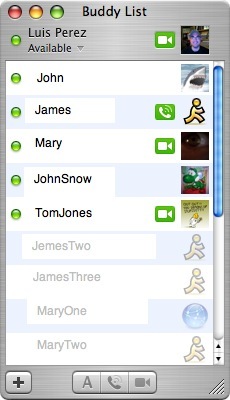 Once everything’s configured, iChat will open and display the Buddy List window. This is where you’ll be able to see who is available to chat once you add people to your Buddy List. Your account appears at the top and your current status should show you as being “Available” in the menu. 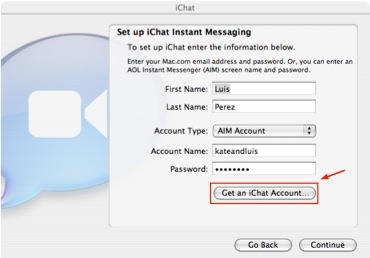 Other iChat and AIM users who have added your account to their Buddy List can view your name and status in their window. You may also see a green icon next to your iChat picture. If your computer has a built-in mic (or you have an external one plugged in) you may see a phone icon, which lets your fellow iChat buddies know that you’re available for audio chat. If you have a Firewire camera connected to your computer (such as an iSight or DV camera), a movie camera icon displays to let other iChat users know that you’re available for video chat.